The R means Rey, the king: it's e4, P-K4, quite likely the first move most of us learned by name. Hence the first we learned to write, in whatever notation was first taught to us, which in my case, some thirty-five years ago or more, was descriptive. My copy of My Sixty Memorable Games uses descriptive, as of course did Bobby Fischer: I used it myself until about 1980, then switched to algebraic and never switched back: but like a language learned early in life, I can read it, and think in it, as easily as I can algebraic. In chess, at least, I am bilingual. I'm glad to have learned both: it gives me easy access to an older literature which may cause younger players than I to stumble. When I came to Spain I found that some of the older players - and, naturally, all the older literature - also used descriptive. I'd not realised this - I'd been under the vague and obviously ill-informed impression that like the metric system, algebraic was a Continental style which had been happily used by everybody else in Europe for decades, perhaps right back to the nineteenth century. Not so: when I was learning descriptive, Spanish children of the same age were learning it too. Now what's odd about it is how hard I find it to follow. Of course the names of the pieces are different and hence the letters which are used to denote them - instead of B for Bishop we have A for Alfil, instead of R for Rook we have T for Torre, whereas R itself, as seen above, means Rey. 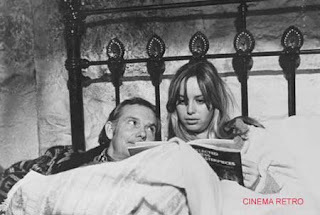 But I don't have any real problem following Spanish algebraic - I can write it myself swiftly enough, though I imagine I will always write, illegibly, my own scoresheets in the language which comes to me naturally. P4R, though, gives me problems. I have to think it through, much as I have to try and compose a Spanish sentence in my head before speaking. I have to check it with myself. I am not immediately sure. Why should this be? I suppose on one level it is that the elements come in a different order, the number of the rank coming after the letter of the file just, as the adjective in Spanish habitually comes after the noun which it describes. That's one thin - it might even be the most important thing. But the other is simply its shape. It looks strange. And the reason it looks strange is the absence of the dash. For nearly four decades I've been used to seeing P-K4, not PK4. The dash, mentally, plays the part of "to". Pawn to king four, p dash k 4. I expect it to be there. I don't know why. It isn't there in algebraic - indeed, algebraic is distinguished in my mind by the absence of the dash, that's what I first noticed about it when I first saw it as a child. Or short algebraic is, at any rate: the long algebraic which I briefly used (having been so advised, I think, by Chess for Tigers) employed the dash, though there's no obvious reason why it should have to. If it's possible to write P4R it should be possible to write PK4 or e2e4. But we don't - and unfamiliarity breeds confusion. Now when one sees cultural differences one wonders about their origin, and whether it has always been like that, and how different conventions came to be agreed and accepted in different places. I don't know, for instance, whether Spanish chessplayers have ever written P-4R, or whether the two different styles existed alongside one another (as did algebraic and descriptive, in the England of my youth) until the dashless version superseded the other. Similarly, I don't know whether the dash has always been there in English, or whether the style PK4 was ever tried and rejected. I have, I am sure, seen some players write their scoresheets like that. But was it ever adopted as a style of preference in English-language literature? Naturally a dark square is in the right hand corner, but who are the pieces? And why? Internet users who want a closer look can click the image to enlarge. But interested club members may want to check out the original, because it apparently resides in The White Horse pub in Brixton. As many of my club mates know, I'm due to become a father in March, of a boy. Quite often I'm asked, will I teach him chess? I make the joke to all and sundry that I'll teach him to be (a) highly competitive and (b) slightly worse at chess than me. Non-chess players don't tend to get this joke at all, not even drawing the inference that this way I'd always get a good game from a player I can beat - the sad dream of every armchair Grandmaster such as myself. Like most expectant parents, I like nothing more than rattling off a long list of boring facts and anecdotes whenever I can about my baby to be. What size the scan says the baby's legs are compared to normal; how he's kicking around inside Sarah like the footballer I never was; when he's due, and so on. Due March 30th? replied club mate and fellow blogger Morgan Daniels. Doesn't that mean he was conceived around the time I slept over . . . on your sofa!? Cheeky, the inference. I see what you're getting at, I replied. But then, at least I'll be able to beat him at chess. Names are another one that come up frequently in conversation. There aren't many chess-related names that wouldn't sound demented: Nimzo Chivers, Kalashnikov Chivers, 3000Elo Chivers. But anyway, we're thinking of maybe Peter Franklin Chivers. Of course there are two Peters in the world chess elite, but there's nothing particularly chessy about the name itself. And K, as we all know, is the dominant letter for world class chess players: Karpov, Kramnik, Kasparov. But I don't feel tempted to suggest, say, Kevin instead of Peter. That, after all, would make his initials KFC. I'm happy to report that the boy's mother is not at all anti-chess. Indeed, she survived the ordeal of searching the Chessbase website to buy me several chess goodies for my recent birthday. So if the boy wants to learn the game, she'll clearly not try to stop him, despite witnessing what the game has done to me. Still, chess is like food poisoning: to know the full horror of it, you have to have it on the inside. And on the subject of horrors lived from the inside, my chess recently reached a new low: agreeing to a draw in a won position. See the diagram. I played 48...Kc6? and the game ended in a threefold with 49.Na6? Kb5? 50.Nc7+ Kc6? 51.Na6? Kb5? draw. This year so far I'm averaging about four ?s per game, and at least one ?? - an average that would be higher were it not for a short draw last week where nothing happened. And they say your standard only really starts to fall when you become a parent for the first time . . . Finally, in the last of these posts I asked for an alternate name to Chiv Chat: I liked the responses I got, but I'm still undecided. Further suggestions welcome. Nice Person Points never run out. PS. Would you teach your kids chess - or save them from it - is the subject of a recent post here at The Closet Grandmaster. Will Wright is another generally acknowledged genius of the game world. 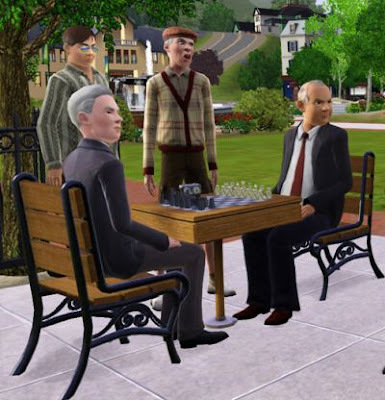 His first great creation, The Sims, took the ideas of Abraham Maslow about mankind’s 'hierarchy of needs' (food, shelter, security and so on, up to 'peak experiences') and applied them to a game in which users could set the rules for their various characters, and then allow them to go off and interact with each other. Well, maybe, though to make an unoriginal but not invalid observation, people who are that interested in interacting with each other might prefer to do so in reality rather than through the remote medium of the internet. I was reading the local paper the other day while in a bar - a bar, of course, is a common environment for interacting with other people, so obviously I was reading the paper in order to avoid it - and came across an item about The Sims 3, which has recently been released (or is due to be released soon, I'm not sure which). I have never played either of the game's two previous versions, but what attracted me to the story was the image below. Chess in the park. (In fact, there's more than one table: the picture in the paper showed another one in the direction where the apparently discombobulated figures are all looking.) Well, that looks good. But do they play? Apparently they do. 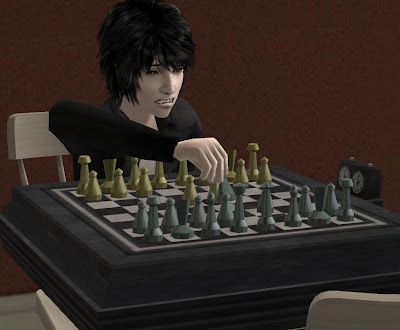 I was able to track down a couple of images of chess from the previous version of the game. A Queen's Gambit is underway. They invariably answered my question "What is there to do here?" with: "Well, what do you like to do in RL? You can meet people, dance, gamble, date, buy clothes, hang out...whatever you want." "But why wouldn't I do the things I like in the real world in the real world?" "Because here you can do them better." Well, maybe again. In the virtual world I can be a much better player than I'll even be in the real world. I can even fool Nigel Short that I'm Bobby Fischer. But whether that's doing chess better than playing face-to-face, I doubt. As for interacting with each other... I doubt that too. More likely you'll be sitting there playing virtual chess on your own. Horton-Portero, Casino Jaque v Marcos Frechin, Aragón League 2009. 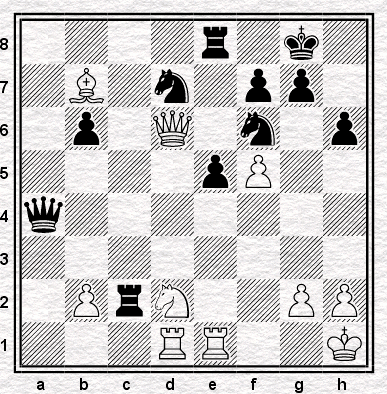 Position after Black's 30th move. 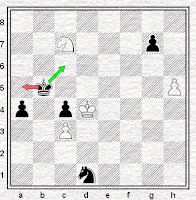 White has sacrificed a pawn to catch Black's king in the centre with queen and rook available to try and deliver mate: Black's rook is undeveloped but the queen has some capacity to do damage to an unprotected White king. 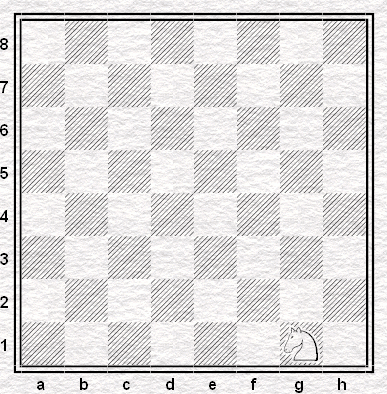 With eight minutes on his clock, plus thirty seconds a move, White begins with the obvious (and correct) 31.Qd3+ as indicated in the diagram. 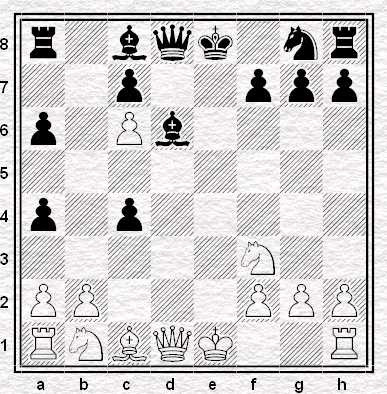 If 31...Kxe5 32.Qg3+ ends the game so Black must (and did) try 31...Ke6. In truth, Black is lost - but what's the best way to win? No computers, if you would, and I'd like to see variations, please, not just White's next move. It's the first team first today - thanks to two terrific results, and two interesting games we have to offer. The results first. Away against a strong Coulsdon team in the Surrey League on Monday 12th January, our first team performed a real David-slays-Goliath act. Outgraded on average by over 20 points against a team who'd won all their matches so far, we sneaked through to claim victory 4½ to 3½. Board 6 in particular witnessed a heroic effort from Martin Smith, who in beating an FM graded 25 points higher than he, delivered mate on his own (as in Martin's) back-rank! Great stuff. Clever Clog Points for pointing out where white might have improbably saved the second of these games toward the end. Thanks to John & Jeremy for sending these in. Elsewhere in the London League, the news is not so good in Division Four where our third team started the new year with a 5-2 defeat to King's Head (with one adjourned.) The League Table rather suggests promotion looks unlikely, alas, this time around. A similar story in Division Three you might think, but there are signs of a late resurgence in the team's fortunes. From the 2008 match against Cavendish Thirds that was left 3-2 against to them with five adjourned, we've run out 5½ to 4½ winners: quite the turnaround. Can we expect similar from the January 19th match versus Drunken Knights 2, that stands 4½ to 3½ to them with two adjourned? We can certainly hope! And that's it for this week. The next club update is scheduled for two weeks, which will include a report on our performance against the all-conquering Wood Green side in the London League. Wish us luck! Last weekend T.C. was planning how to use his birthday cinema tickets. Where have you gone Brian London? Our nation turns its lonely eyes to you. ...has played chess with a Grand Master and former President of the World Chess Federation (hence the chess-pun titles of her alien romances). As for me, I've lived on the edge of the sort of life which inspires me to note that there are at least three errors of English in the paragraph above. But that's probably why I shall be playing chess today, and Ms Cherry (not, I suspect, her maiden name) will be living a life among alien gods. Or something similar. Or maybe she will be busy at her desk, adding to her apparently Orwell-inspired oeuvre - among which are such works as Forced Mate, Mating Net and Insufficient Mating Material. I, at least, am not making this up. After I lost the game which was the subject of Tuesday's column - and during it - I assumed that it had followed the trajectory my games habitually follow, to wit that a good opening had led to a promising middlegame, which I had then thrown away, as I usually do, in a tactical skirmish. I was surprised, therefore, to look at the game with Rybka and find that in the early middlegame, before the aforesaid tactical skirmish (in which I did indeed throw the game away) it liked White's position a good deal more than it liked mine. 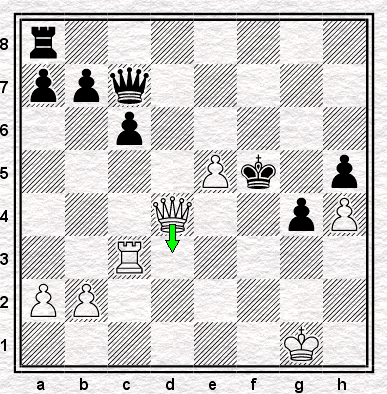 The game began 1.d4 d5 2.Nf3 Nf6 3.e3 c6 4.Bd3 Bg4 5.c4 e6 6.Qb3 dxc4! 13...O-O 14.f4 a6 (perilously close to draughts) 15.h4 Rfd8 16.Ra5 b5 17.Bd3 Bf8 18.Ke2 Bb4 19.Ra2 c5 20.dxc5?! reaching the position we interrogated earlier this week. As I say, I was rather expecting Rybka to show, if anything, a small advantage to Black for most of the play given above and I was surprised - almost offended - to discover the opposite. 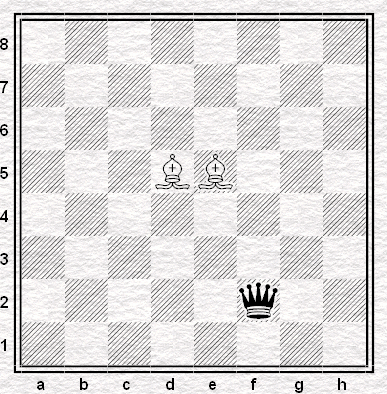 Rybka likes White's position a lot: for example, in the diagram position after 13.Be3, it swiftly shows a White edge of more than +0.80, and at 17-ply it's still as high as +0.77, indicating that Black is really up against it. Now I'm not tied to computer assessments. There's not much point in observing that, say, Fritz gives +0.47 for White, if you don't know why this is: nor is that +0.47 line necessarily better than another one which is given as +0.15, just because the computer thinks it is. Programs possess algorithms, not the mind of God. Nevertheless, I've learned to respect these assessments, especially if you can't in the short term find a line which causes the computer to revise them. Certainly I'd be unhappy to play against that 0.77 in a correspondence game, even if I couldn't see how it was going to increase, let alone that it would lead to a win for White. Still, during and immediately after the game I held a completely different view and I suspect I would take the same approach to a similar position if it occurred in another game. I thought White was jumbled up, lacking mobility, obstructed by his own pawns, while Black, notwithstanding his lack of space, had a more harmonious set-up, with time to organise a break (as he duly did). I don't suppose my play was anywhere close to optimal - nor my opponent's - but was I really so wrong in my assessment? Perhaps. Perhaps I was misled by my relative familiarity with Slav positions, and hence felt comfortable even though strictly speaking and objectively, I should not have. Perhaps I was misled by the chessplayer's natural optimism that derives from the fact that we make our moves (the process Rowson terms Narrative) and hence we naturally see ourselves as in command of the game - while the opponents merely respond, as best they can, to our initiative. Or, perhaps, I was just suffering from the typical response "he's gone wrong so I must be better" that occurs when the opponent seems to have missed a tactic (as he had in the first diagram, after 6...dxc4!). This is not at all uncommon in my games, as, even though I say so myself, my knowledge of the opening outlasts that of my opponent rather more often than not. In this instance, I'd had the position after 6.Qb3 before (I'm sure the game is in a comments box somewhere, though I cannot find it now) and had discovered 6...dxc4 with the computer's help when looking through the game afterwards. The opponent was the first to be surprised. Hence I often think I'm better... because I am better? Except that perhaps I'm not. Perhaps, even when the opponent is surprised, I'm only comfortably equal. I do, after all, have Black. Or perhaps I was better - or I was equal - for a bit, but I subsequently let it slip. It can be hard, without a blunder to crudely make the point, to understand that your position has deteriorated. But of course it happens all the time. But there is another possibility. Which is that my judgement is right and the computer's is wrong and that the position was, in fact, perfectly OK for Black. I don't think I was so far out in my assessment, not as far as the computer thinks I was at any rate. So I appeal to the court of public opinion, unreliable though it may be. Which side of the board would you prefer? And how far does the computer's assessment affect your choice? 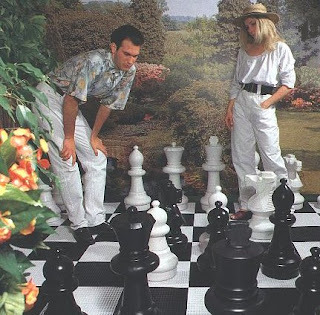 Back in November I wrote about Isolated Queen's Pawns and how I generally preferred to play against them than with them. Various club mates joined'Dave' from the comments box to the original post in suggesting that Baburin's Winning Pawn Structures would be a useful study guide if I really wanted to get to grips with IQP set-ups. Young Martin Smith generously loaned me his copy and I've been slowly working through it for several weeks now. The first half of the book lays out the advantages of having the IQP with each chapter dedicated to a particular theme. 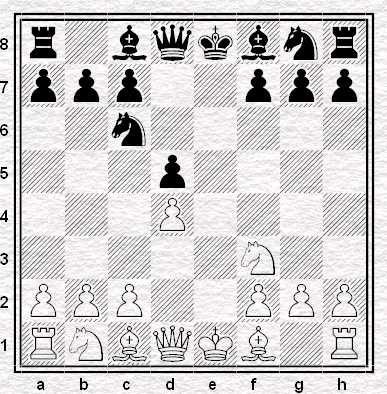 The third for example shows how the posession of such a pawn can facilitate a kingside attack by means of a rook lift. It includes the game from which the following position was taken. Happily the White side of the contest was taken by a prominent former S&BCCer. He has just chased an enemy knight back to c6. 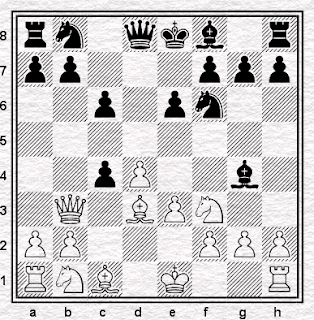 His IQP is under pressure but in exchange he has a large number of pieces pointing at Black's king. How to proceed? Given this is a puzzle position I don't think it's too difficult to guess what the continuation must be. The tricky bit is proving the idea actually works. Sitting at the board during a real game 'this probably does the business' is not really good enough is it? I think it's the third move that's the real key. Specifically, it's necessary to see in advance why White has to play it and not something that's similar and at first sight looks much more natural. 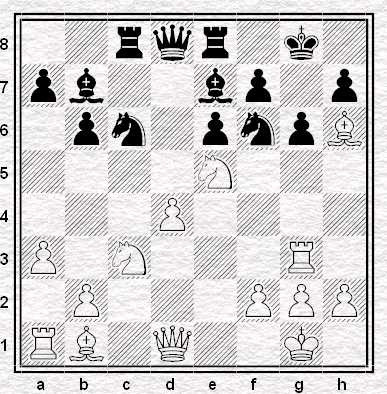 One final clue ... the position shows White to play his 18th move. He ended up mating Black on move 26. Sometimes I worry that we live in some sort of hellish pop cultural doldrums. It is a concern that I am of the generation that has declared U2's Joshua Tree the second best album ever made. What of the best minds: destroyed by madness, starving hysterical naked? No. Just as it is counter productive to elevate bores to holy cow status in order to make ourselves feel better, so too is it irresponsible and dishonest to deny that some greats still walk (and create) among us. 'If culture is dead' wrote Ross Woodman in his spendid survey of insanity and romanticism, 'pieces of its rotting corpse still proliferate everywhere we turn, like the body of the dead poet in Adonais'. Jonathan's favourite Jerry Sadowitz is still as foul and perceptive as he was twenty years ago, if not more so; with his last three albums Bob Dylan has shown, once and for all, that he's forgotten how to be boring; and, nestled away in deepest, darkest Ohio, Robert Pollard continues to release over a hundred songs a year, an alarming amount of which are actually very good indeed. 1. Pollard is a very prolific artist. 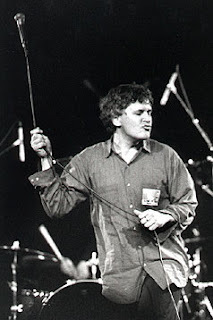 At present he has 1138 songs registered with BMI , which goes some way in representing the fifty or so full-length albums he's released as Guided by Voices, Robert Pollard or one of his myriad side projects (Circus Devils, Boston Spaceships, Pscyho and the Birds, Airport 5 and Lexo and the Leapers, to name but five). He is also a successful collage artist and recently published a selection of his work as Town of Mirrors: The Reassembled Imagery of Robert Pollard. 3. Up until the mid nineties Pollard was still a fourth grade teacher. Again, references to this other life can be seen scattered throughout GBV ouevre: 1993's 'Big School' is an obvious example. But permeating much of the early material, too, is a childlike delight in the fantastical: songs about robots, kicking elves and warlocks riding roosters abound. Pollard's long teaching career perhaps also explains his propensity to address his audience, even now, as 'kids', as well as his implied belief that songwriting is a 9-to-5 job. There's plenty more where this came from. Don't worry, Jonathan's back tomorrow. Güetas-Horton, SMA Barbastro v Casino Jaque, Copa Delegación semi-final 2009, board one: position after 20.dxc5?!. 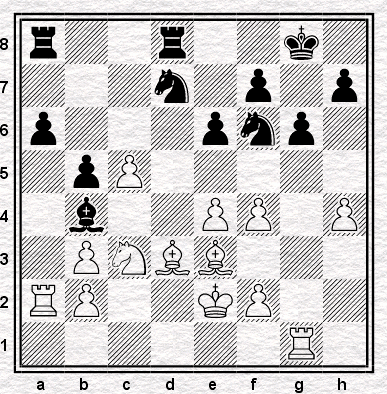 Black can recapture with the bishop or the knight. Which do you prefer - and why? Note: fortnightly club news will begin again next Monday. Total lack of modesty prevents the present writer not mentioning his own second place finish. I should admit, however, that I would have wound up much lower down had the two highest rated entrants (T.C. and Rob T) been able to return for the second week and I'd not benefited from extremely fortuitous wins against both young Martin Smith (fifth) and Chris Morgan (third equal). ... and my heart sank when I recalled that in Chess for Tigers Simon Webb uses this precise opening as an example of the best way to play in quickplay games. Get as much activity as possible and don't worry about sacrificing material was his advice. Especially if it's just one measly pawn I suppose. Webb illustrated his argument with Sokolov - Speelman from a Spanish rapid play match at the end of the 1980s. I vaguely remembered that Sokolov got stuffed after playing 5. d4 so I tried 5. Nf3 instead but in short order found myself on the wrong end of a very bad kicking nevertheless. Chris thoroughly deserved to go on to win but somehow let me slip out of trouble. I'd love to show you the whole game but Spess's win is infinitely prettier so here's that one instead. For the time honoured reason that the good players were unavailable, I made a rare appearance for the Surrey first team last Wednesday in the match at Coulsdon. Despite the fact we were outgraded on every board, the average difference being more than 20 ECF points in the home team's favour, we actually led 3.5 - 2.5 as the end of the evening approached. The two games that remained to be decided were a dodgy looking position on bottom board and young Martin Smith in the midst of a furious time scramble so any match result was still possible. Fortunately Streaham's answer to Magnus Carlsen held his nerve and mated his opponent with just seconds of the session remaining thus securing for his side a very enjoyable victory. I mention all this because on the way to the match Angus told me that over the weekend just gone a total of seven S&BCCers had turned out for a county open team. Not bad, I thought, for a relatively small club but what I found even more remarkable was that the seven were spread across five different sides. Impressive but surely not a record. Can our readers suggest what that would be? while it may look pug ugly to me has actually been reached by some of the world's best players. Specifically I was thinking of Kasparov - Bareev, from a Paris quickplay tournament in the early 90s. You could just dismiss this as 'only' a rapid game but around the same time Gazza also punted the Exchange during the Tilburg Grand Master tournament. In fact he played it twice, beating Korchnoi in the second round and having much the better of a draw against Nigel Short in the sixth. Despite these impressive results it seems that Gazza didn't consider the experiment worth continuing. A few simul games aside I can't find any further examples of Kasparov on the White side of a C01. Shame. 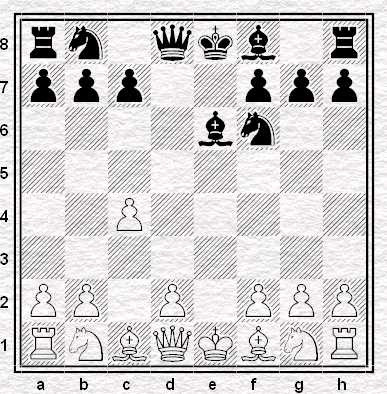 "It seems to me that 3 ed is a shameful move for White to play"
"This variation is adopted with a view to obtaining a quick draw...."
Perhaps they all have a point but while I know it was just a couple of games and I know it was nearly twenty years ago maybe if Kasparov can use the Exchange to try in win games perhaps we can too? 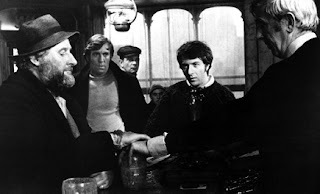 When it comes down to it isn't the French Exchange, just like any other opening, just as interesting as we choose to make it? When it comes to chess, I'm not particularly big on sharing. For instance, the more children who learn about the delights of our game, the more who will beat me in a few seasons time. Ideally, I'd like chess to become increasingly unpopular to the point of vanishing: for therein lies my only real chance of gaining the World Championship. Here's an idea. Perhaps dinosaurs will now become increasingly popular at the expense of chess, and thus in time I will rise to become World Number One! (Number one chess player, that is, not dinosaur.) 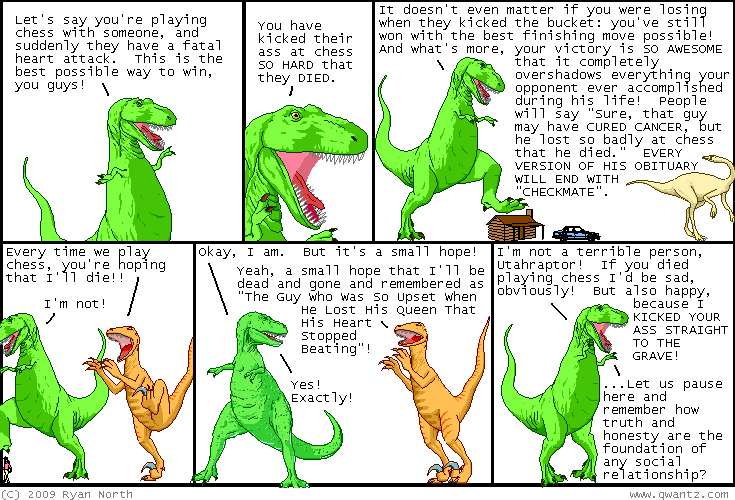 Yet - regrettably - it is of course possible to like both chess and dinosaurs. Indeed, I used to play online as 'Jurchessic Park' myself. And probably therein lies the secret of my failure. I have an on again off again acquaintance who within a very short time of our meeting last year took to addressing me as "Geek Boy". While this could not by any means be mistaken for a term of endearment I don't believe it was meant to be particularly unkind. The intention, I think, was to be descriptive rather than judgemental but in any event I have to concede she has a point. We may not all be loner serial killers but chess players, let's face it, are not generally seen as dripping with social skills. An unfair stereotype? 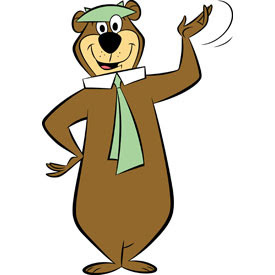 Perhaps sometimes, perhaps often, but am I alone in letting my inner geek run free a little more frequently than the average bear? It's fair to say that some of the ways I like to spend my time when not playing our favourite game could, if portrayed in an unfavourable light, be considered a little nerdy. Even within the context of a rich seam of geekiness available to be mined in the hobbies I find myself attracted to, if I were in the mood to be honest I'd have to admit I do tend to dig somewhat more deeply than is strictly necessary. However much T.C. might think playing Sicilians would improve my chess, in my eyes the (alleged) thrills on offer could never compare with a good Exchange French. Similarly with science fiction I can't help but feel there's nothing in modern TV or film that will ever match Blake's Seven (GOO, GOO II, GOO III) let alone old school Doctor Who. For a few years now my interest in the dark arts has been pretty much limited to hunting down old and slightly obscure magical texts. It's not so much of a challenge these days - the combination of the expiration of copyrights, pdf reprints and the internet mean you can, in the unlikely event you are so minded, get your hands on all sorts of stuff without any difficulty at all - but it keeps me busy between chess commitments. Why am I telling you all this? 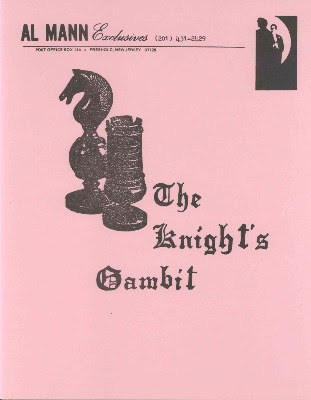 Well, last weekend I discovered an Al Mann manuscript for sale with the intriguing title of "The Knight's Gambit". The blurb promises "mentalism using chess pieces" employing "a method that plays on words and by which miracles are wrought!" 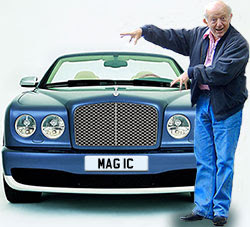 " ... beginning a long career in the churning out of mentalism product for the moneyed faithful." Yet still I'm tempted to buy it because I'd really like to find out what's in it. True it's not likely to earn me any brownie points with the OAOA acquaintance but I think she'd enjoy gaining a bit more evidence for her thesis. * He sounds a bit like Raymondo don't you think? What role does Svetozar Gligoric's Selected Chess Masterpieces play in cinematic history? Previously I'd always followed Nigel Short's example and played 4. ... Bg4 here but inspired by my pre-Christmas purchase of The Flexible French I gave the knight move a punt recently and it turned out very well indeed. "This symmetrical knights' 'Kung fu' allows Black to unbalance the game." Now I like the move but I'm not too proud to say I don't get the point Mosky is trying to make. Why does developing the queen's knight turn the game into a "Kung Fu Fight"? Can anybody out there explain? To my eyes today's position looks a bit strange yet it's cropped up in the games of some fairly tasty players ... but how do we get there from the starting position? For those who want it there's a clue in the comments box. As the comments box quickly spotted, yesterday's position was from the game Polgar, J v Kasparov, Linares 1994: Polgar has just played 36.Nb3-d2. Garry Kasparov took a move back in his game against Judit Polgar. Except Judit, no one else saw the takeback, but Spanish TV filmed the scene. Kasparov dropped the Knight on c5, lifted hand a bit, then saw he was losing a Rook, took the Knight back to d7 and few seconds later played Nf8. Judit was stunned, looked around for the arbiter but didn't complain at all. There's more discussion on the incident here, and in many other places on the internet... but what there doesn't seeem to be, is any of the "Spanish TV" footage of the incident. Which rather surprises me. And which is rather a shame. 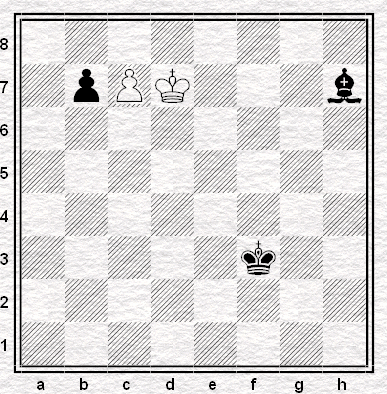 From a 1990s grandmaster tournament: Black to play. What happened next? Back in November on the English Chess Forum, one poster wrote that anyone appointed to select the English Olympiad squad of chess players should "have . . . a minimum level of education (a good degree from a good University or a professional qualification)". My first reaction was one of puzzlement. Caissa cares not for such things, it is only battling on the board itself that counts; qualifactions are but pieces of paper wafting on the wind, next to the brutal fact of a checkmate. That's the nature of chess and insight into it. However, a thoughtful recent article over at The Chess Drum called Do Chess GMs need Higher Education? made me rethink my opinion. In particular it struck me that if we could make selection to the Olympiad squad dependent on education, then it would only take a few minor tweaks to the selection criteria -requirements for both a science degree and an arts degree, plus an A-level in Media Studies for the savvy required to avoid any further Gormallygate-type incidences- and, heck. I might even be in the team in a few years . . . It's not a secret that Christmas is no good for your chess: the champagne you put in takes brain cells out; and what you gain in mince-pies, you lose in Elo. And so what better a way, amidst all this cold weather, to warm up your chess in 2009 than with a Rapidplay Tournament? As luck would have it ---- that's exactly what we're running, starting tonight down at our club venue Woodfield Grove Tennis Club, with three rounds starting at 7.30pm and then a final three rounds next Tuesday. 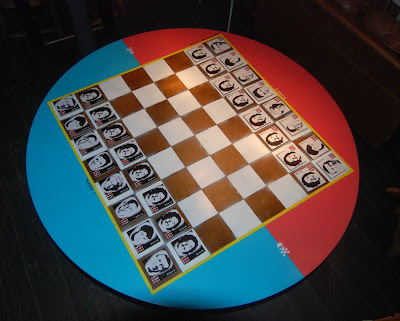 The rate of play is 25 minutes each per game, and entry is free for members of Streatham and Brixton Chess Club as well as for members of Streatham Chess Club. PS. There's still time to enter ---- to do so, please email Angus or turn up tonight at the venue by 7.15pm. 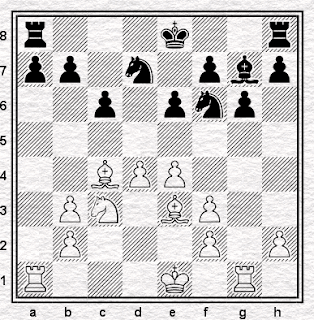 The White knight is on its home square (g1) but its objective is to play to Black's king's home square (e8). However, after each move Black may place a mine on any vacant square other than e8 itself - and if the knight subsequently sets foot on that square it is blown up. 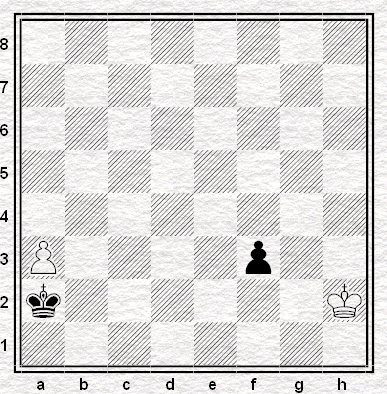 Can the knight succeed, or can Black eventually surround it with a cordon of mined squares? 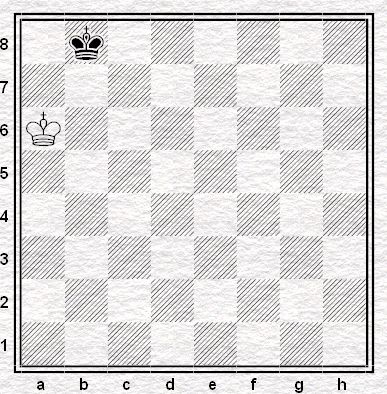 Place the two kings on the board such that White, to move, mates in one.